The Amouage Beloved for Women Eau de Parfum is a fragrance dedicated to loved ones, an intimate aroma as soothing as an embrace. 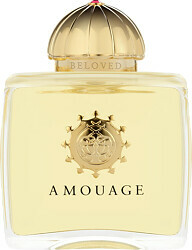 Love and comfort is the core of this dewy, floral fragrance with woody accents. Composed using signature essences that evoke the sensation of warmth that treasured memories bring, it is a perfume of remembrance as told by the master perfumers of Grasse. Aromatic top notes of sweet rose and jasmine reveal a spicy mélange of white flowers in the heart. Succulent vanilla and a timeless accord of cedarwood, sandalwood, amber and musk are richly woven in the intricate base to leave an alluring imprint.